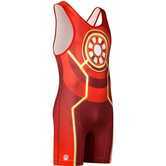 Ok, hang on, wait… “designed wrestling singlets”?? What? Yes. 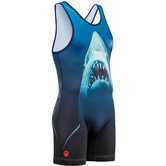 We admit it, it’s not a widely-adopted term for a category of wrestling singlets…yet. Rest assured, we are not intentionally trying to mislead or confuse you, or make up new terms to make ourselves look cool. We already look cool. 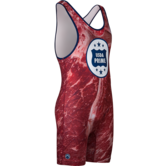 The term “designed wrestling singlets” was the best thing we could come up with to define singlets that have a custom design element to them, usually using sublimation (but not necessarily), but are not made-to-order. 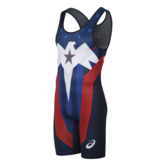 They, essentially, are just super awesome looking stock singlets that required the delicate hands of graphic designers to turn spandex onesies into art. They don’t fall under the “fully custom sublimated” category because these are not custom templates that can be altered and customized for teams. 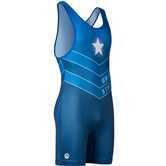 Most, if not all, of our designed wrestling singlets are made using a process called sublimation. Rather than selecting pre-dyed fabrics in different colors and then adding graphics, we start with a totally white fabric and use special printing machines - literally, it’s like an enormous color printer - to dye the entire color scheme and artwork deep into the fabric. After they’re printed, the singlets are cut from the roll of fabric and sewn together. Using this process opens up so many opportunities for us to get really creative with our designs. There are no limitations with regards to the number of colors or complexity of the artwork. 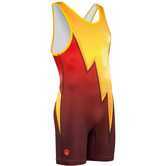 If you’re not convinced, take a look at the Rasta Singlet. Another major benefit is that there will never be any cracking or fading, like you would see on a screen-printed singlet. 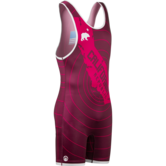 Over the years, we’ve been experimenting with different singlet designs and graphics, but still nothing has quite outshined the famous USA Eagle Singlet, one of our earliest designs. 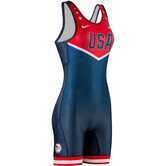 And hey, the USA Crest Singlet is pretty cool too. 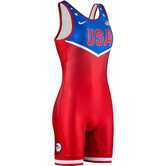 It was inspired by the 1996 Olympic wrestling team uniforms worn by legends like Kurt Angle, Bruce Baumgartner, Tom Brands, Kendall Cross, and Kenny Monday. USA! USA! … Of course, Cali never gets old either. 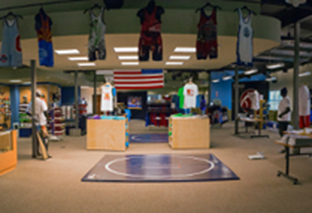 We have California gear coming out of our ears at WrestlingMart, and we’re still making more! 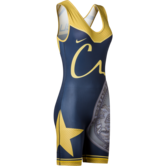 The California Flag Singlet and the California Beach Singlet are classics, but the Golden State singlet we’re most excited about is the all-new CA USA Wrestling 2017 Team Singlet. 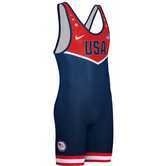 This singlet is being made for the young men and women heading off to Fargo to represent CA in the Cadet and Junior National Championships. 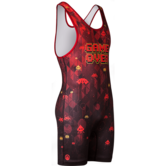 The Digital Camo pattern is another new staple in our singlet lineup, and we don’t know how we ever got by without it. 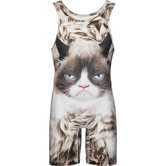 Of course, if you really want attention or want to cause a distraction, look no further than the Hungry Kitty Singlet. We’ve got dozens more new designs coming down the pipe, but don’t hesitate to let us know if you have a suggestion! 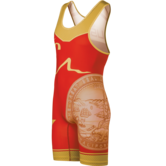 If you have any questions, feedback, or comments regarding designed wrestling singlets, please let us know by emailing support@WrestlingMart.com or call 888-887-8893.